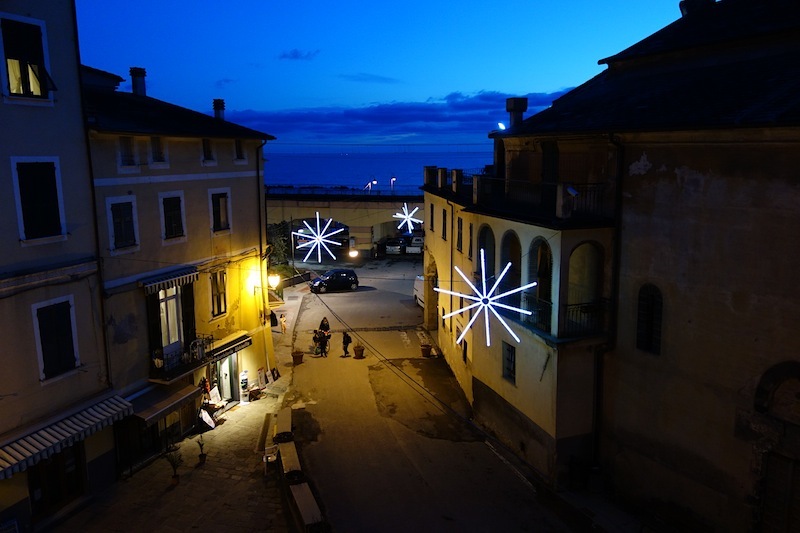 Today we took a train to Monterosso in northern Italy for the Christmas New Year period. We are in the company of Rahel, her husband Michi, baby Emma and Rahel’s father, Peter. 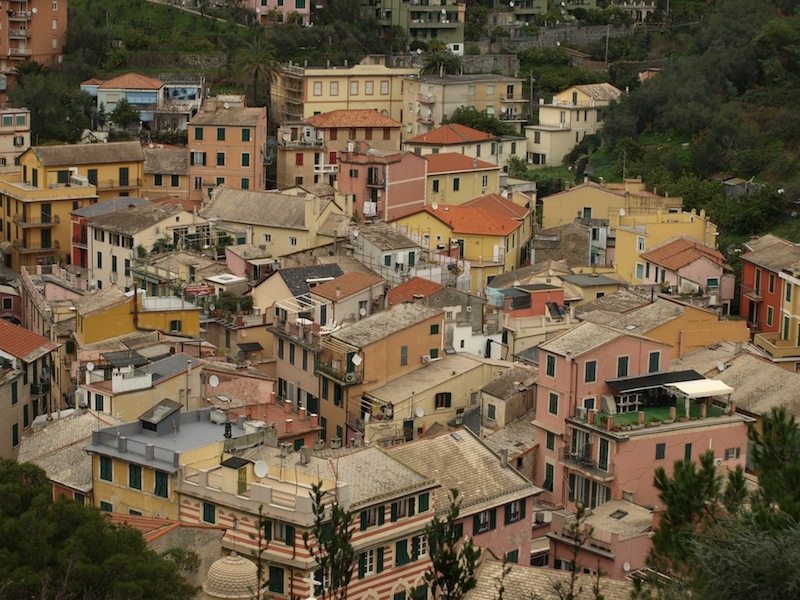 Monterosso is one of five villages that are part of the Cinque Terre National Park. 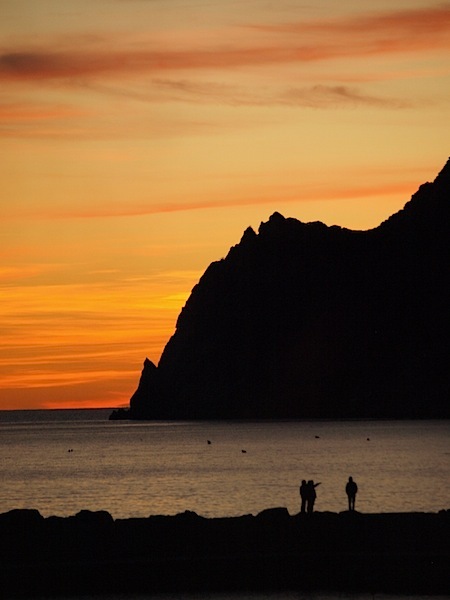 The coastline, the five villages and the surrounding hillsides are a UNESCO World Heritage Site. The train journey went like clockwork. 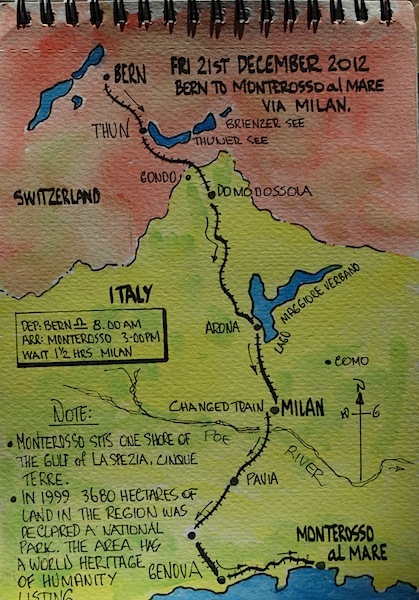 We arrived in Milan on time (Swiss trains arrive on time 99.9% of the time) and changed to an Italian train bound for Monterosso. Swiss Federal Railway clock, an example of Swiss cultural style (mentioned in Bern blog posting). The Swiss Federal Railways clock designed by Hans Hilfiker has become a national icon. I sense this every time I look at it and it makes me feel comfortable that the journey ahead is going to happen without hassle. The clock is special in that it stops for just over a second at the end of each minute to wait for a signal from the master clock which sets it going again, thus keeping all station clocks synchronized. 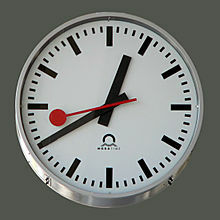 In 2012, Swiss and world media reported that the design of this clock had been copied without prior permission by Apple Inc. and used in the iOS 6 clock application on Apple devices. On October 12, 2012, SBB (German initials for Swiss Railways) published a statement saying that the two companies had come to an agreement resulting in Apple Inc. licensing the clock’s design. The early part of the journey was foggy which meant we missed seeing the alpine country and the Po River. One reference relating to the Po valley said, ‘ Always prone to fog, the valley is subject to heavy smog due to industrial atmospheric emissions, especially from Turin’. The waters of the Po fair little better with regards pollution. In 2002, the city of Milan had no sewage treatment plant. The sewage went through channels directly into the Po River. Results of tests carried out on water samples in 2005 found “staggering” amounts of benzoylecgonine. Benzoylecgonine is excreted by cocaine users in their urine. If the figures are correct it means 2.7 percent of Italians use cocaine every day. Note to readers: When writing this blog I sometimes think I may be including too many facts (some might consider it useless trivia) such as the details relating to the health of the Po River. I wax and wane as to weather to include some things, but in the case of the Po it’s my way of expressing how inconsiderate humanity is to the environment they live in and the fact that every country has an undesirable underbelly. 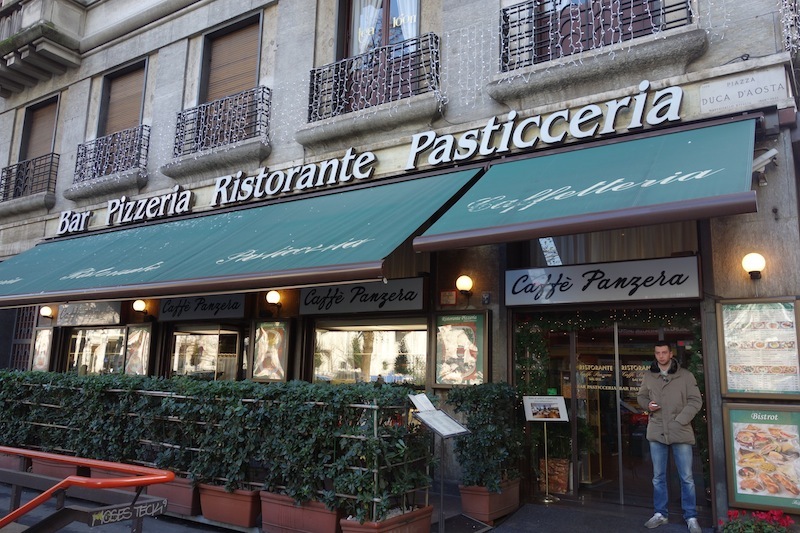 In Milan we had one and a half hours to spare before taking an Italian train to Monterosso so we went to the Caffe Panzera for morning tea. The café was traditional Italian, the type of place the fictional Belgian detective, Hercule Poirot, and other Agatha Christie characters would frequent. It had class. The decor inside the bar/cafe had an art nouveau look. On the walls were many historical photographs. I love these café that double as an art gallery as viewing old photographs on the walls is a good introduction to understanding the local history. 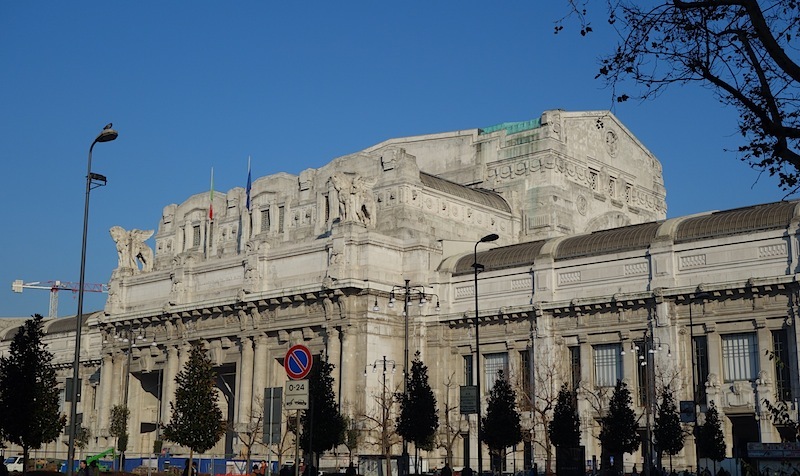 There are few buildings of interest to the artist near the Milan railway station, not even the railway station itself, even though it is hailed as an architectural masterpiece. To my mind it is a humongous blot. 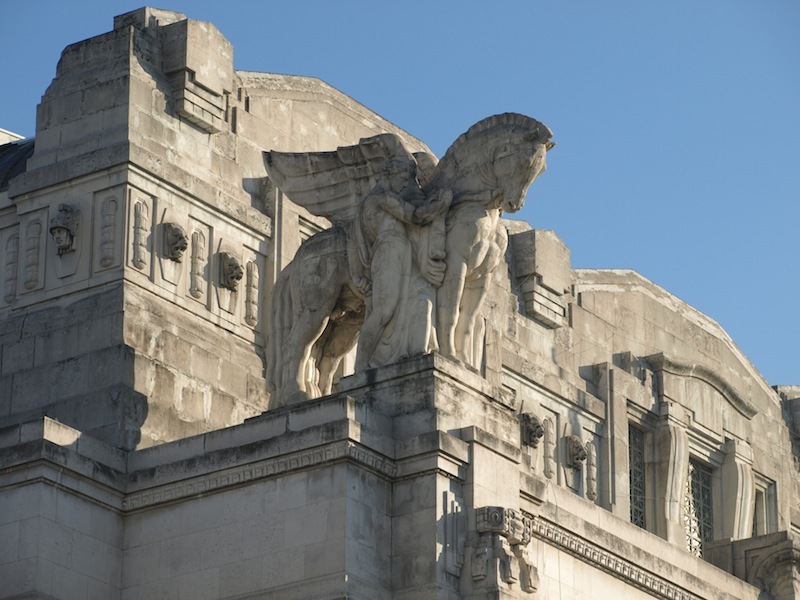 The ‘blot’ is described as Roman Eclectic Liberty (art nouveau) style architecture. 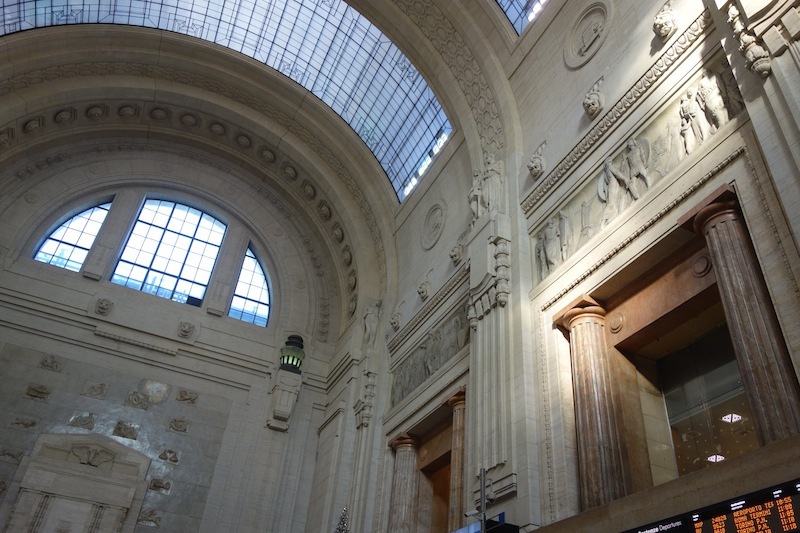 King Victor Emmanuel III of Italy laid the cornerstone of the station in 1906, before a blueprint for the station had even been chosen. 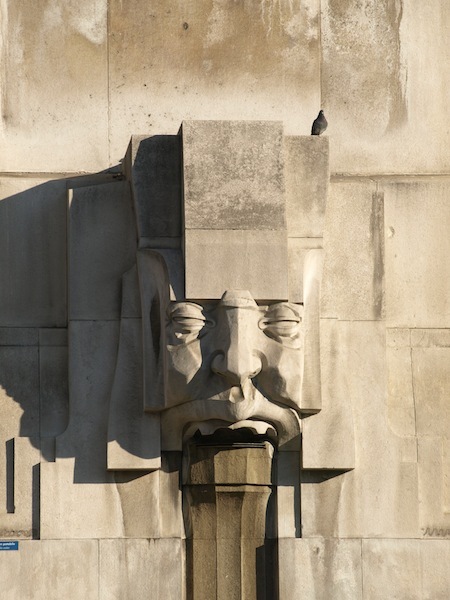 The design was modelled after Union Station in Washington, DC and the construction of the station began in 1913. Due to the Italian economic crisis during World War I construction proceeded very slowly and the project, rather simple at the beginning, kept changing and became more and more complex and majestic as time went on. This happened especially when Benito Mussolini became Prime Minister. He wanted the station to represent the power of his fascist regime. The station was officially opened on July 1, 1931. Benito Mussolini created the Fascist Party in Italy in 1919, eventually making himself dictator prior to World War II, until being killed in 1945. Facade of Milan railway station. Looks like a Benito Mussolini inspiration. 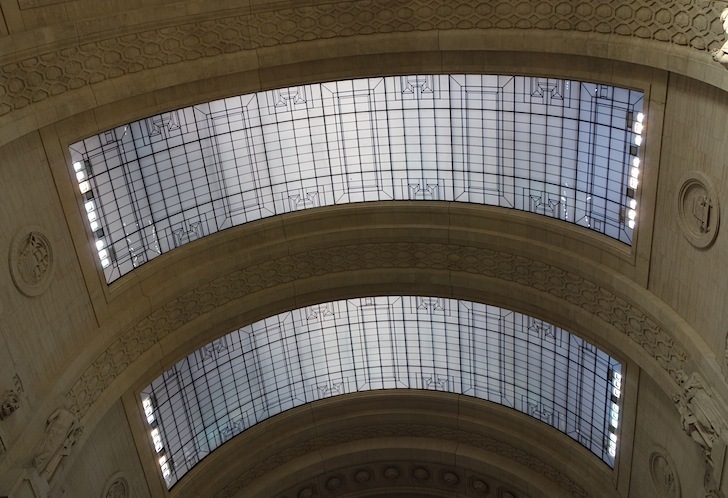 The magnificent glass roof of the terminus. 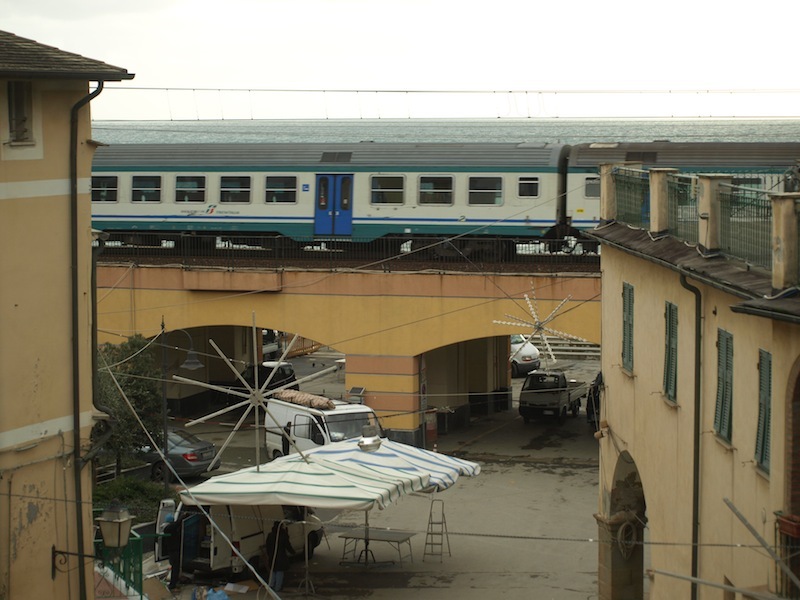 The train arrived at Monterosso on time. Our hosts commented that it was an unusual event for an Italian train to arrive on time. I think the Swiss are critical of other countries’ public transport systems as their Swiss system is almost perfect. The banter between ‘them and us’ is similar to the friendly banter between Sydney and Melbourne. 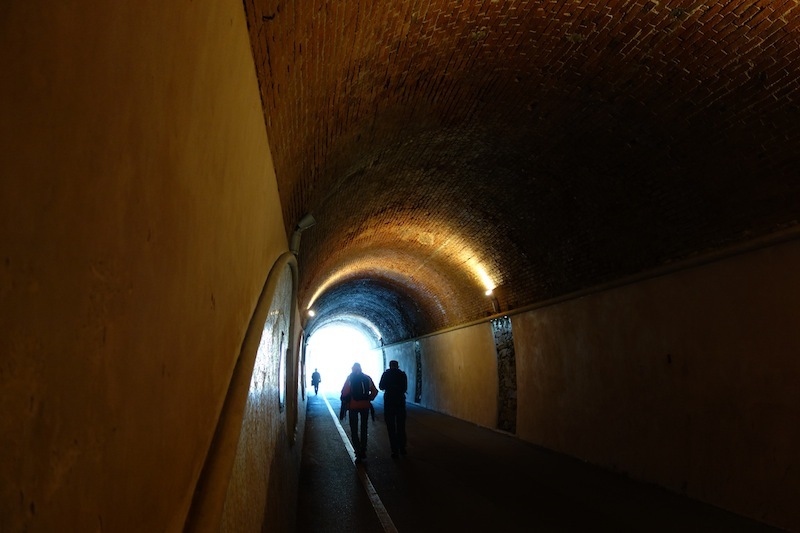 After leaving the train at Monterosso al Mare in the new town we walked through a tunnel to the old town where we are staying. The tunnel linking the new town with the old town through which we walked was in fact the original railway tunnel built in 1880. 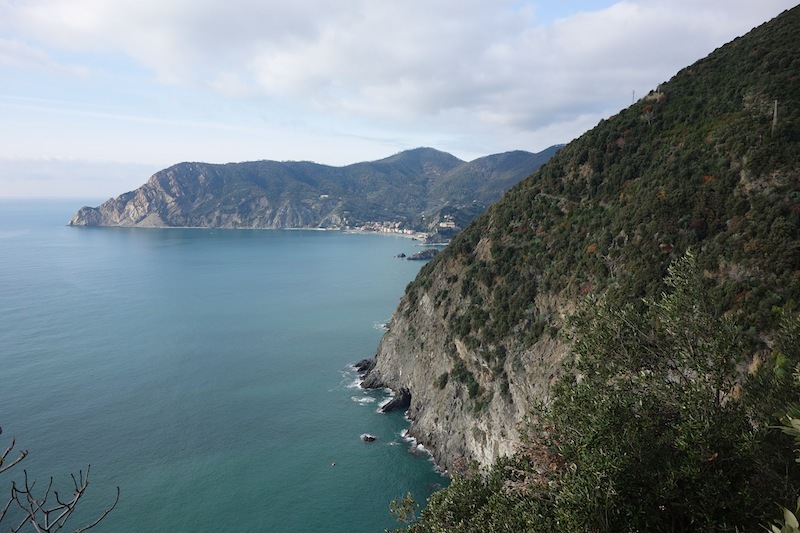 Prior to the railway being built, Monterosso and the four other seaside villages in the Cinque Terre region were only accessible by boat or donkey/mule trails. The old 1880 railway tunnel, linking Monterosso’s new and old town. Coastal fringe, around Monterosso. Look at the blue sky. It’s easy to understand why northern Europeans come to these parts for their holidays. 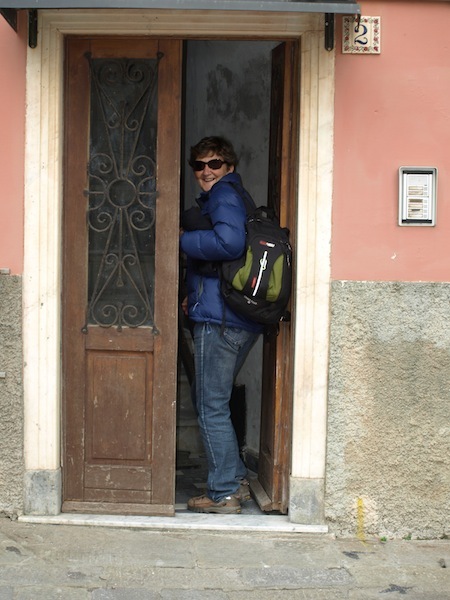 Because it is winter most hotels are closed but Peter managed to find a very comfortable apartment for our ten-day stay in Monterosso. 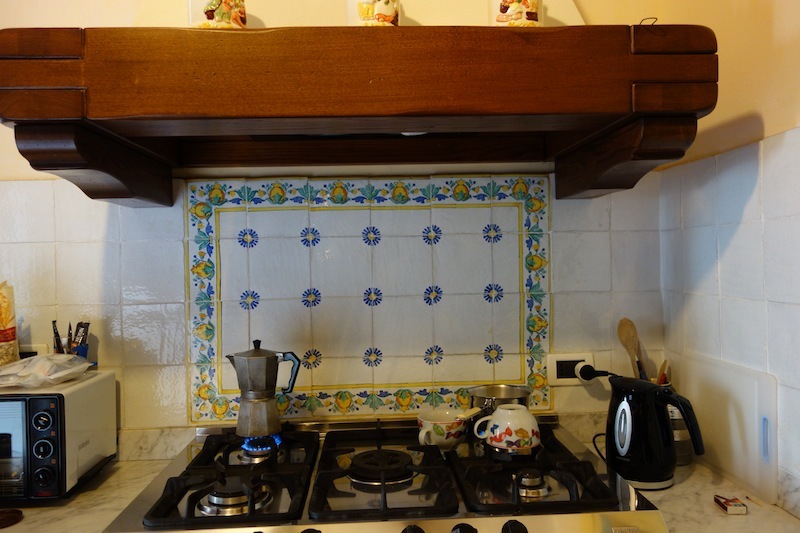 The cooktop in our apartment. Note: I’m warming the cups. I have stopped having cuppas in cafes as they are never hot enough. If you are going to have a cuppa it has to be hot, not lukewarm! I have been told cafes refrain from serving hot (I mean hot hot) drinks because people might burn themselves. Also note the solid 150 x 150 lumps of timber surrounding the extractor fan and the beautiful mortise and tenon joints on the corners. Bev squeezing through the front door of the apartment building. Our apartment is located next to the St John the Baptist Church, which is the centre point for the town, and is one of many old apartment buildings, cafes and souvenir shops in the village. Nowhere in our travels, except perhaps in Corfu in 1972, have we had such ‘old world’ views from any hotel, hostel or apartment. 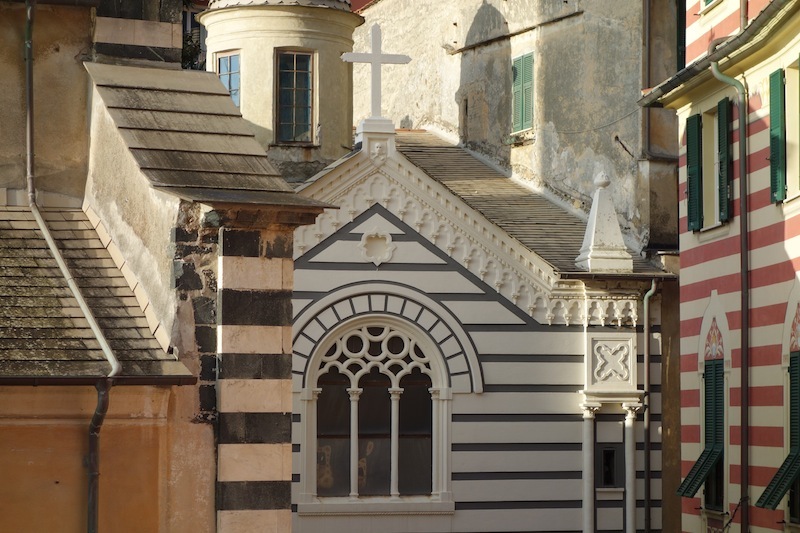 There are a couple of striking features about building decoration in Monterosso and one is the use of different coloured stone. I have been told, and have read, that the black stone is either black marble, basalt, serpentine, black dolerite, limestone, travertino or it is simply painted. This is something I have to get to the bottom of. The end wall of the St John the Baptist Church. 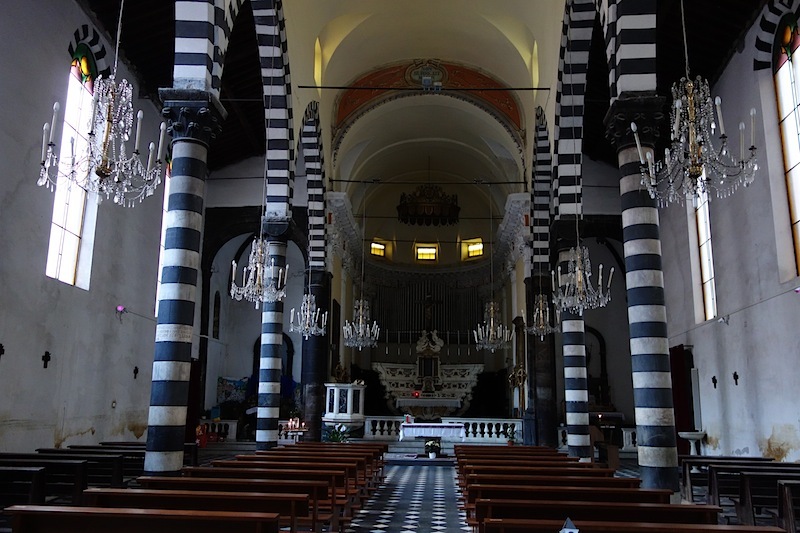 Even inside the church stripes are the go. One of Bev’s night shots across the village square. Taken from our apartment living room. Daytime shot of village square with train, taken from our window. The railway viaduct in the above photograph can be clearly seen. In the distance is the Ligurian (Mediterranean) Sea. I suspect there would have been some vocal opposition to the viaduct being built where it is as it does spoil the view seaward. The 1880s line would have been much lower than the present one. 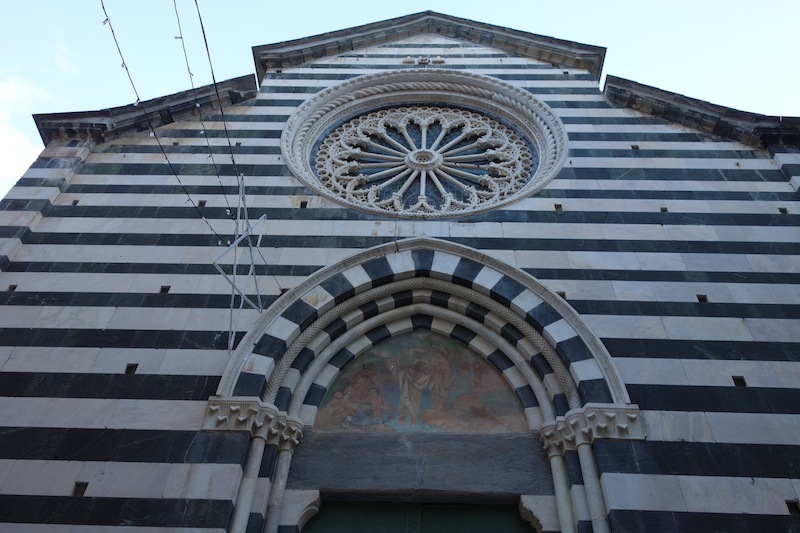 When staying in a new location such as Monterosso I try to formulate in my mind how the town or village developed. Of course in the case of Italy I have to think back thousands years. The geography of the area determined how development took place. For pioneers looking for a place to set up camp the criteria would be… a place to get away from raiders, a location where subsistence farming could be undertaken, close to a potable water supply and, if possible, access to the sea. The early pioneers who settled the Cinque Terre region must have thought they had stumbled into the Garden of Eden when they came ashore here as all these features were available to them. However, as we all know, there were dangers in the Garden of Eden, maybe not temptation and serpents but there were dangers, and the danger here was floods. 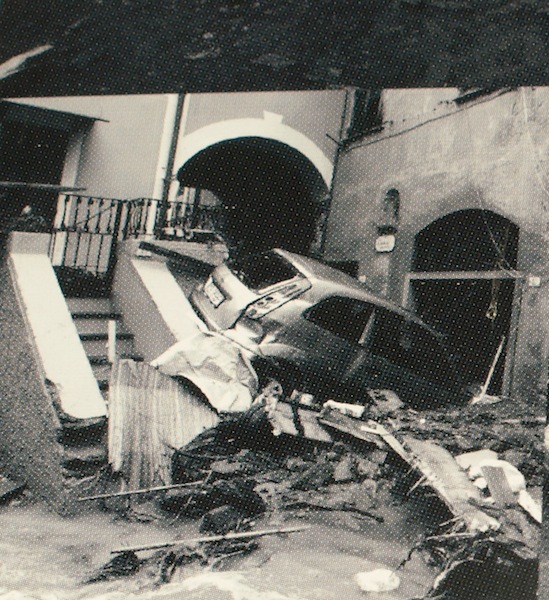 As recently as 2011 unprecedented rains resulted in massive mudslides which buried parts of the town under four metres of mud. Portion of Monterosso old town. Our apartment is in the middle of the photograph. The town is located in a valley with steep mountains encompassing it on three sides. When it rains run-off has to pass through the town. This is what happens when you live in a flood prone valley. As I said, the only access to the outside world prior to the 1880s (when the railway came through) was by boat or via precariously narrow donkey tracks benched out of the east west cliff face along the edge of the sea. Typical of the country where donkey/mule tracks were benched out of the cliff face. 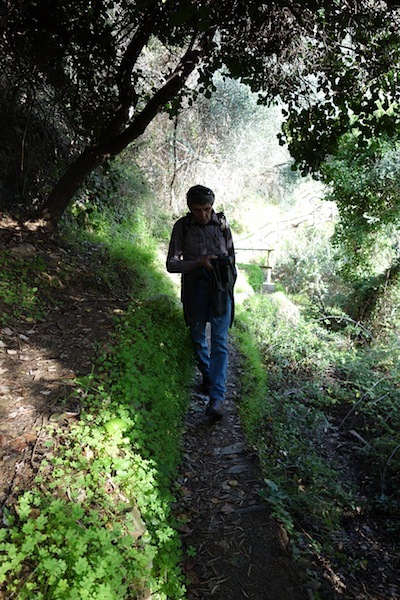 Here I am on what I assume is one of the ancient donkey tracks. 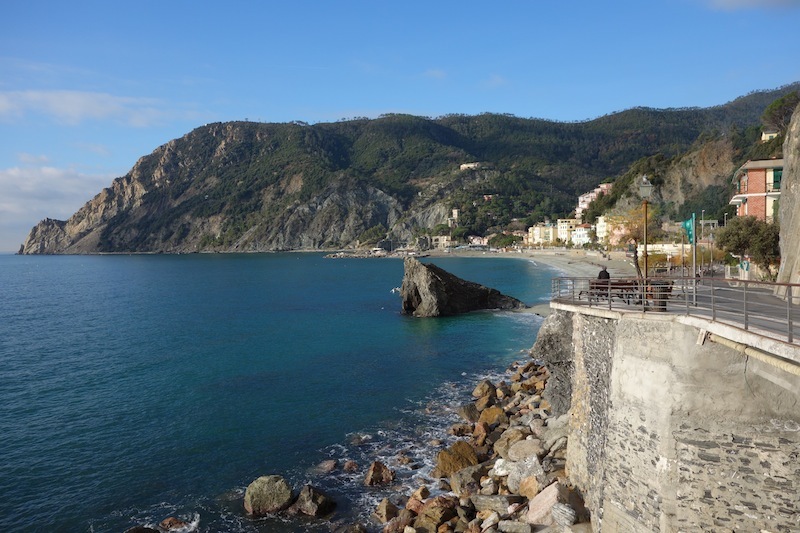 Living in a town like Monterosso and having access to the sea had advantages and disadvantages. The disadvantage was that seafaring raiders and pirates could easily come ashore and plunder and create nuisance generally. To make their town less vulnerable to sudden attack the inhabitants built observation towers. From these towers observers could warn inhabitants that an invasion was imminent. 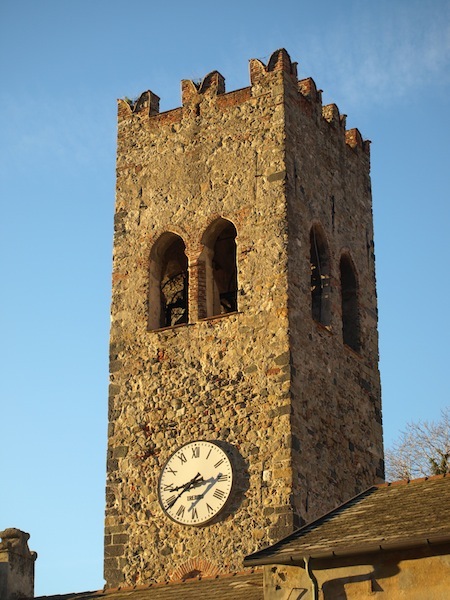 Over the years the inhabitants built a total of thirteen towers in Monterosso but now only three remain and the most prominent is the medieval Aurora tower (now the St. Giovanni Battista parish bell tower). The medieval Aurora tower. Now the St. Giovanni Battista parish bell tower. End of the day in Monterosso. 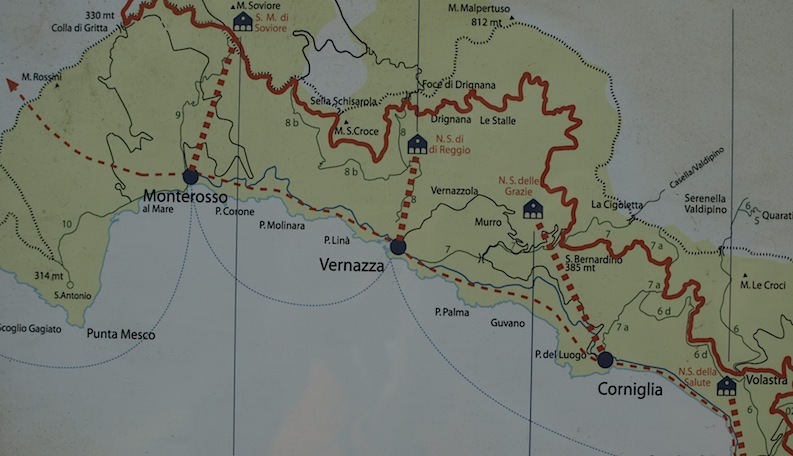 Tomorrow the weather forecast is favourable so we are taking the train to Vernazza then walking back to Monterosso through a part of the Cinque Terre National Park. The map below shows the route. The Cinque Terre stretches out along the coast of Liguria, the Riviera di Levanto, between Levanto and the Gulf of la Spezia. No worries getting off topic good to hear from you. Re the work with doing a blog I will be posting in a few days the last day of our odyssey and in that posting I have detailed the ins and outs of blogging (from my point of view) as a number of people have asked the same question. Bev and I are on Thursday Island in Torress Strait at the moment and will be for a while, I’m teaching pottery here and Bev is tutoring the local kids. I am still writing and soon will be posting our experiences here, it gets in the blood this writing and blogging caper. I hope the post relating to our last day answers some of your questions. Thanks for the comment re the Swiss clock. I did mention this on the blog maybe it didn’t show up as it should have. Bev and I on Thursday Island at the moment. Will email you soon.